Sweet Party! 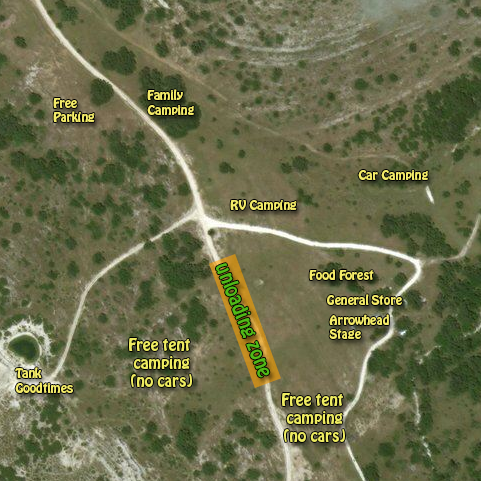 is an extra intimate, family reunion campout at Four Sisters Ranch in Utopia, Texas. There will be a few bands starting Friday afternoon on the Arrowhead Stage, followed by Tank Goodtimes. The Arrowhead Stage will resume performances early Saturday, followed again by Tank Goodtimes. Group discounts for 4, 8, and 10. If you have a larger group, email sweetparty4sisters@gmail.com for a deeper discount. Tickets are held at will call. Primitive Tent camping is free. You will pull up to the 'unloading zone', unload, and return vehicle to Parking area. Car camping upgrades are available, if you want to camp next to your car. One pass is required per car. Every car in car camping area must have a car camping pass, and must be purchased in addition to any and every every entry pass. RV Camping upgrades are available as well. Family Camping is reserved for families with children. It is conveniently across from the parking lot, but car camping passes may still be purchased for the area. Thursday early camping passes are still available. No scheduled music. Gates open at 9am every day. We strongly encourage you to arrive no later than 9pm, and if you're staying elsewhere, depart by midnight. There are tickets still available, as well as group discounts. Let us know if you have a group bigger than 10 for deeper discounts. Can combine your previous order! Please continue to invite your friends. Next week, Sweet Party! and UTOPiAfest Eleven ticket holders will receive a special invite to our secret private SXSW shows! Be on the lookout. Please make sure your vehicle is fully legal, and obey all traffic laws coming in. The incoming county road speed limit is 30. Thanks again for coming along. Please treat everyone and the land as respectful as we always have, so hopefully we'll be welcomed back to Four Sisters many times in the future. Thanks also for being a part of ViVA UTOPiA, by attending. Your presence and support is hugely appreciated and needed to keep UTOPiA alive now and forever.